John Wesley Chatham (born October 11, 1978) is an American actor. He has appeared in films such as In the Valley of Elah, W., The Help, and The Philly Kid, and plays Castor in The Hunger Games: Mockingjay – Part 1 and Part 2. Since 2015, he stars as Amos Burton in Prime Video's The Expanse. Chatham was born October 11, 1978 and grew up in North Georgia. Chatham's parents divorced when he was two and he spent most of his childhood with his mother, sister and brother. On a whim, Chatham's mother took his sister to an audition for a Tide commercial in Savannah, Georgia, and brought Wes along. While waiting for his sister in the lobby, Wes was spotted by the casting director and, at the age of five, he was offered a national campaign for Tide. At the age of thirteen, Chatham moved in with his father and, without a lot of supervision and as a restless and rebellious teen, he was kicked out of high school and sent to the Give Center in Lawrenceville, Georgia, to finish school. The Give Center was a second chance school for troubled youth, offering very small classes. While he was attending classes at the Give Center, a professional theater company out of Atlanta started a mentoring program with the school, and Chatham was chosen to write a play that was later performed by his classmates. It was from this experience that he found his passion for the arts. After graduating from high school, Chatham joined the military. He worked as an aviation firefighter on the flight deck of the USS Essex, working in crash and salvage for four years. Chatham's break into acting came just three months before his tour was finished when Denzel Washington chose his ship to shoot the movie Antwone Fisher. Chatham was amongst those selected by casting director Robi Reed while Reed was searching for authentic-looking military personnel for the movie. This was Chatham's first movie-making experience, which led to further pursuit of his lifelong dream of acting. Following Antwone Fisher, Reed convinced Chatham to move to Hollywood and shortly thereafter cast him in his first series regular role on Showtime’s Barbershop. Chatham gained further attention when Paul Haggis cast him alongside Tommy Lee Jones as Corporal Steve Penning in In the Valley of Elah. In 2009, Chatham went on to work with Oliver Stone in W. as Frank Benedict, George W’s fraternity brother. The following year, Chatham landed another series regular role on the hit CBS TV show The Unit. Chatham was cast as new unit team member Sergeant Sam McBride (aka Whiplash), working with David Mamet and Shawn Ryan. Chatham also starred as Brian Danielson in Brett Simmons’ Husk (2011). Chatham portrayed Carlton Phelan, Emma Stone's character’s brother, in the 2011 film The Help. The cast won a 2012 Screen Actors Guild Award for Outstanding Performance by a Cast in a Motion Picture. In 2012, Chatham landed his first title role in Joel Silver’s The Philly Kid. A fan of mixed martial arts, Chatham dove into the character of Dillion McGwire, performing all of his own stunts. The film debuted in theaters May 2012. Following The Philly Kid, Chatham starred in This Thing With Sarah, which was accepted to the San Diego Film Festival in October 2013. In 2013 Chatham wrapped two studio films, Broken Horses (2013) and The Town That Dreaded Sundown (2014). In November 2015, Chatham began starring as Amos Burton on the Prime Video TV series The Expanse. Chatham is married to TV personality Jenn Brown. Together they have two sons, John Nash, born in 2014, and Rhett Jameson, born in 2016. 2005 Sleeper Cell Frat Boy Episode: "Al-Faitha"
2012 Political Animals Gunner Cox Episode: "Lost Boys"
2012 The Mentalist Vince Episode: "Cherry Picked"
2017 The Night Shift Clark Episode: "Keep the Faith"
^ Rebecca Ford (September 23, 2013). "'Hunger Games: Mockingjay' Adds Wes Chatham". The Hollywood Reporter. ^ a b "Wes Chatham - Bio". 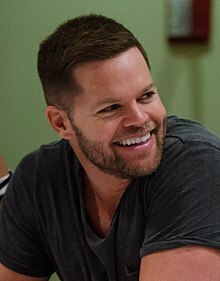 officialweschatham.com. ^ THR Staff (29 January 2012). "SAG Awards 2012: The Winners List". The Hollywood Reporter. ^ "This Thing With Sarah". thisthingwithsarah.com. ^ Petski, Denise (October 29, 2014). "Dominique Tipper, Wes Chatham, More, Round Out The Expanse". Deadline Hollywood. Retrieved January 5, 2015. ^ "ESPN's Jenn Brown is Engaged to Actor Wes Chatham". The Big Lead. September 28, 2011. ^ "Wes Chatham and Jenn Brown Introduce Son John Nash". Retrieved 17 April 2018. ^ "Wes Chatham and Jenn Brown Welcome Son Rhett Jameson". Retrieved 17 April 2018. This page was last edited on 15 April 2019, at 04:38 (UTC).